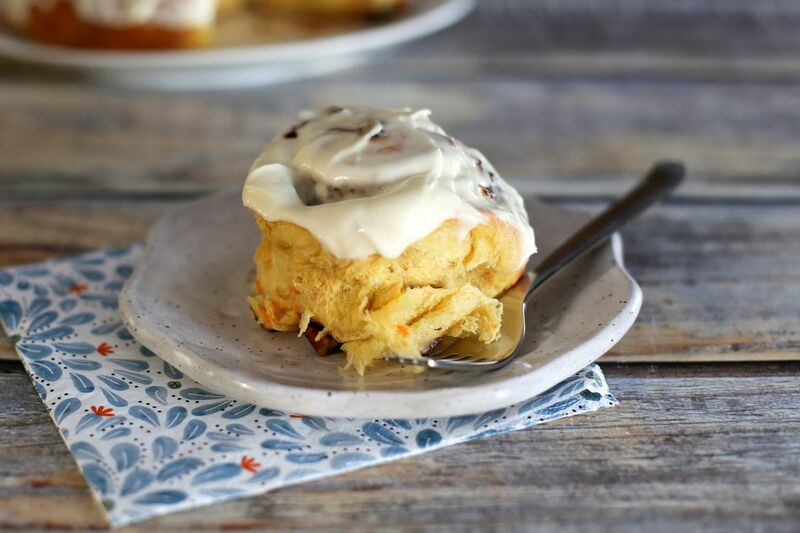 These carrot cake cinnamon rolls are made with a rich and buttery yeast dough flavored with vanilla. Grated carrots add bright flecks of color to these extra-special cinnamon rolls. The cream cheese icing is the perfect topping for the cinnamon rolls. These are excellent rolls to make for a holiday morning, and they can be prepared the day before. And if you have a hard time getting the kids to eat their vegetables, here's one way to get them to give carrots a try. Make them with or without the pecans or substitute chopped walnuts. Put the 1 cup of milk, 1 stick of butter, and 1/3 cup of brown sugar in a saucepan and place the pan over medium-low heat. Heat just until the butter is melted. Remove from the heat and let the mixture cool to below 105 F.
In a mixing bowl with an electric mixer on low speed combine the cooled milk mixture, yeast, egg and egg yolk, about half of the flour, the 1/2 teaspoon of vanilla, and the salt. Switch to the dough hook or mix the remaining flour in with a spoon or your hands. Add the carrots and knead with the machine or by hand for 7 to 10 minutes. Butter a large bowl. Put the dough ball in the bowl and flip it over to coat the entire surface with butter. Put a kitchen cloth over the bowl and let it rise in a draft-free place for about 1 hour and 15 minutes. The dough should double in bulk. Punch the dough down and remove it to a floured surface. Roll it out into a rectangle approximately 10 to 11 inches by 8 to 9 inches. Line a shallow 2 1/2-quart baking dish (or a similar size) with parchment paper and lightly butter the paper. In a medium bowl, combine the 6 tablespoons of melted butter with 3/4 cup of brown sugar and the cinnamon. Brush the mixture over the dough. Sprinkle the chopped pecans evenly over the cinnamon mixture. Beginning at the wide end, roll the dough up to make a tight log. Slice the log into about 10 rounds and arrange them evenly in the prepared baking dish. At this point, you may cover the pan and refrigerate overnight. Take them out of the refrigerator about 1 hour before baking. If baking immediately, cover the baking dish with a kitchen towel and let the rolls rise in a draft-free place for about 45 minutes. Bake the cinnamon rolls for about 25 to 30 minutes, or until golden brown. If your rolls are quite thick, you can check for doneness with an instant-read thermometer. They should register around 180 F to 190 F in the center of the dough portion. Let them cool slightly before icing (see below). In a medium bowl, beat the softened cream cheese with the 1 tablespoon of softened butter and 1 cup of powdered sugar until smooth. Beat in the 1 1/2 teaspoons of vanilla and a tablespoon or two of milk, as needed for spreading consistency. The recipe makes about 10 rolls, depending on thickness. Store leftover rolls in the refrigerator. Reheat in a 350 F oven for about 10 to 12 minutes. If you prefer a simpler and less rich dough, this bread machine cinnamon roll dough is a good option. Just add the 3/4 cup of grated carrots to the dough as it's kneaded by the machine. Sprinkle 1/2 to 1 cup of raisins over the cinnamon filling. Sprinkle cinnamon-sugar over the icing.